This past week, Mom E came out from California to hang out and enjoy a little slice of farm life with us (read: to be put to work!). This time of the year, that garden of ours is a lot of work. If it’s not weeding, it’s picking off and smushing caterpillars. If not that, then we’ve got oodles to harvest, preserve, and devour. Over the past week we brought in the last of our corn (about 15 mini-ears), 5 eggplants, a cantaloupe or honeydew every other day, at least 20 pounds of tomatoes, a gallon of green beans, bowlfuls of ground cherries, enough peppers for salsa and nightly dinners, some more tomatoes, a couple of strawberries here and there, and a wheelbarrow full of potatoes. 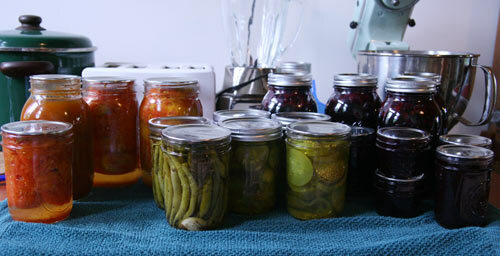 It was super helpful to have Mom in town to help take care of the glut of harvest we’re bringing in right now. 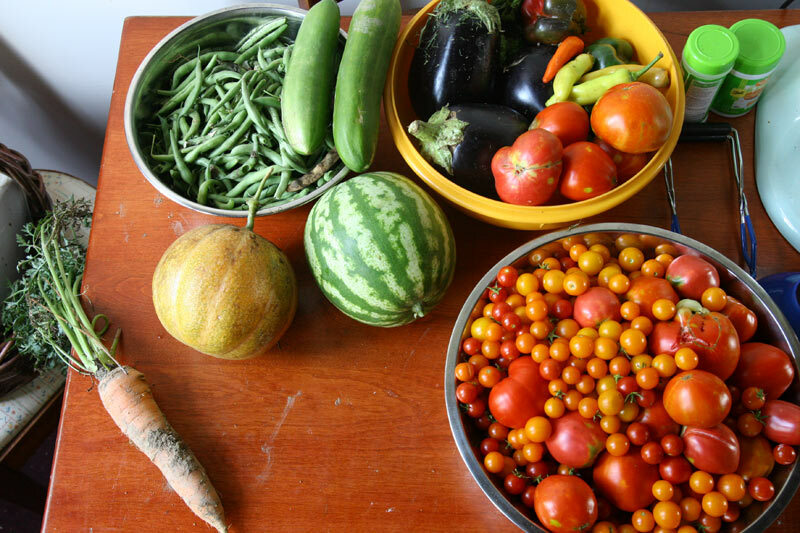 A typical August day’s harvest from our little garden…we harvest around 3 times a week. But we didn’t just harvest our own goods….we also went out to the U Pick farm down the road ravaged their blueberry bushes! Bouahaha! More to CAN! Mom E was continually blown away at how EASY blueberry picking is compared to thorny berries…as you may know, blueberries are native to the east, thusly not a regular my childhood. We would go olallieberry picking when I was younger, and that would require latex gloves and a couple more hours than the 2 hours it took us to pick an entire spackle bucket full. It’s like, all you have to do is approach a cluster with your hand & tickle it, and down they tumble into your basket. I kid you not, we hauled out 19 pounds of blueberries. And nary a blue stain on either of our hands. At 75¢ per pound, that ain’t bad! In all this canning mayhem, we had about four different caning books spread out on the table — in addition to all of the dishes, colanders, jars and such — comparing notes, recipes and modern vs. archaic methods. 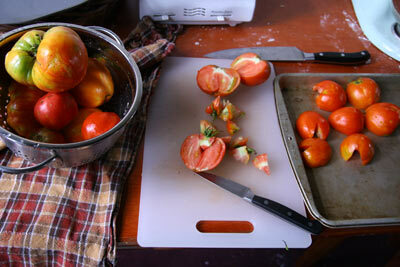 I’ll share with you this delighful recipe I came across and tweaked somewhat for canned tomato salsa. Frankly, I prefer salsa fresca, all crunchy and fresh, but this stuff beats most supermarket stuff. And I’m sure that in February I’ll be quite pleased to whip this out of the pantry. I’ve already made two batches! 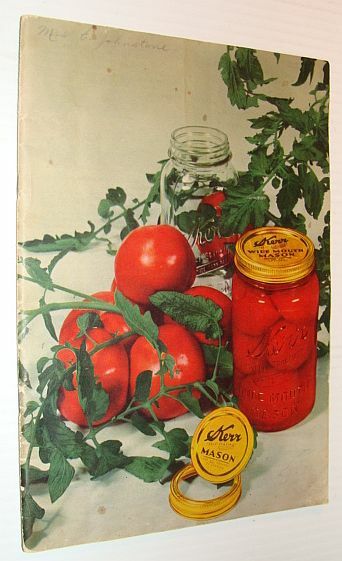 Fair warning: the ratios of tomatoes to peppers, and of vinegar is important to keep accurate in order to create a safely acidic environment when canning. First, core the tomatoes and cut them in half. Place them cut side down on a baking pan along with the garlic in their skins and broil for 7-10 mins until the skin starts to wrinkle and begins to blacken. Let the tomatoes cool to the touch, then peel off the skins and discard them, then dice the tomaotes into rather small cubes. 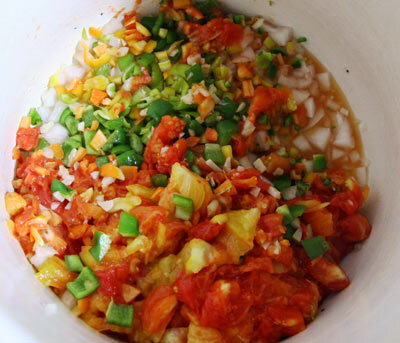 I reserve the juice that comes out during this process & freeze it for putting in soup later on…this makes the final salsa less watery. (You could blanch the tomatoes to remove the skins, but broiling them encourages more juice to ooze out…I think the salsa is tastier with less of the juice). Pop the garlic out of the skin and dice that up, too. Dice the peppers and jalapenos as finely as you like them, making sure that you have no more than 1 1/2 cups. Toss these in a large pot, along with the tomatoes & garlic, and all the rest of the ingredients. Bring the pot to a boil, then reduce to simmer for 10 minutes. Taste, and adjust the salsa for heat and seasonings. Pack the salsa in to hot, sterilized pint jars leaving 1/2 inch headspace, and process in a boiling water bath for 15 minutes. PS – If you’d like to learn how to safely can using the boiling water bath method, check out this tutorial. 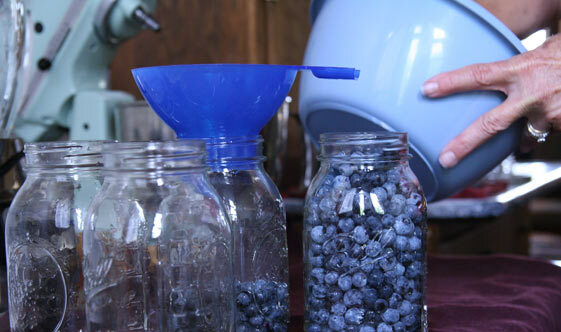 Tags: blueberry bushes, blueberry picking, dinner, ground cherries, vegetarian. Bookmark the permalink. Becky, each time you post, I’m more and more impressed by the fun adventure your and your hubby have undertaken! Keep up the good life and the posts – LOVING following you!! Your Salsa sounds so yummy…and I’d love some of those blueberries right now! Thanks for the vicarious gourmet experience!